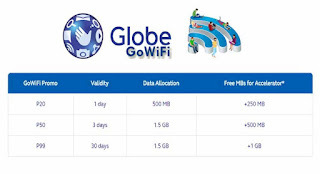 Globe previously launched GoWiFi where you can connect and surf to high speed fast internet using your device with WiFi. Now you can avail this promo and connect to their tons of hotspot nationwide, just turn on your WiFi and connect to GoWiFi or GoWiFiPlus access point to start browsing. Last year they give a free 1 hour high speed WiFi internet per day when you connect to GoWiFi network, but now they trimmed the freebie to 30 minutes access. 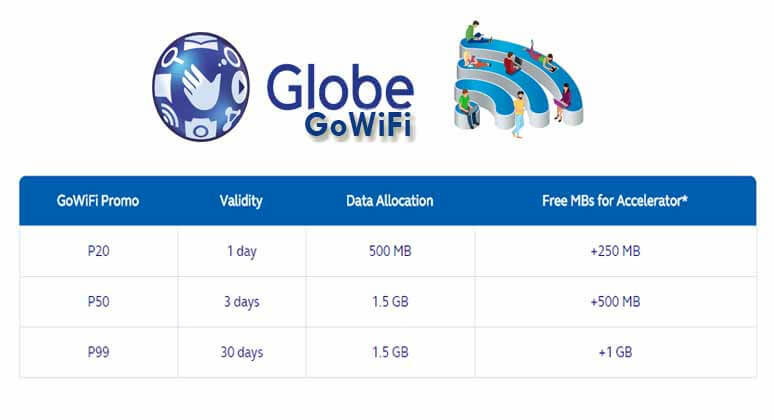 After you consume the FREE minutes of internet, you’ll have to pay or reload your account to continue using the Globe GoWiFi service. It’s up to you if you want to pay or disconnect to Go WiFi and wait for another day to renew your account and connect again the following day. If you want to continue your browsing, downloading and streaming, you can register to their Go WiFi promo for 1 day, 3 days and 1 month subscription. You can connect to any Go WiFi hotspot in malls, airports and other establishments. Before you register, you need to check if hotspot is available in your location. This is also an add-on to GoSURF promo if you want to register via Globe USSD code *143# menu. You can register this promo via addon to GoSurf just dial *143#, select options for surfing and options for GoWiFi. GoWiFi20 – 500MB WiFi internet access for 1 days plus 250MB Free Accelerator for YouTube. Only 20 pesos. GoWiFi50 – 1.5GB internet access for 3 days plus 500MB accelerator. Only 50 pesos. You can also register via GoWiFi homepage or portal to extend your internet browsing. It may require to key-in your mobile number and input the service verification code. Globe GoWiFi promo is available to all networks e.g. Sun Cellular, Smart and TNT (Talk n Text), they can reload or purchase vouchers to nearest Globe stores and retailers.